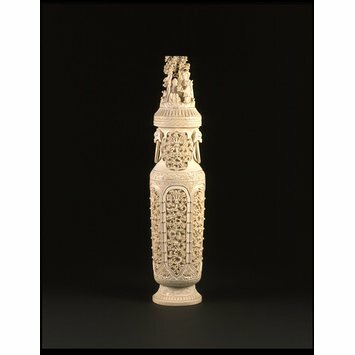 Vase and lid, cylindrical with tall neck and two masked ringed handles, raised on high flaring foot, formed by hollowing out an ivory, the exterior carved with six openwork panels each enclosing two writhing dragons amongst clouds, each dragon in a different posture. Around the panels are rows of small studs, filling the lower corners of the panels are six animal masks in low relief. The upper corners of the panels filled with trefoil patterns, topped by a classic scroll around the shoulder. On the neck between the masked handles are two openwork foliated panels enclosing a full-face dragon. Mouth carved with a key-fret border and foot with a band of clouds between two bands of lotus petals. On the base is a ring of key-fret enclosing two characters tian and di (heaven and earth). The same key-fret and characters repeated on base inside, indicating that the splayed foot is a separate piece which has been attached to the vase. Lid carved in the round with Shoulao holding his staff and being offered a peach by a small boy, whilst a lady puts her hand on the boy's shoulder among trees and rockwork. The bottom part with a band of lotus petals and a key-fret border. On the base, the central part of which is slightly raised to fit into the mouth of the base, is a ring of key-fret enclosing the characters tian and di. Broadly, comparable examples in Lucas, S.E. and Sir Victor Sassoon. The Catalogue of the Sassoon Chinese Ivories, Vol. II (London, 1950) and Graves Art Gallery. Souvenir of the Grice Collection (Sheffield 1958). 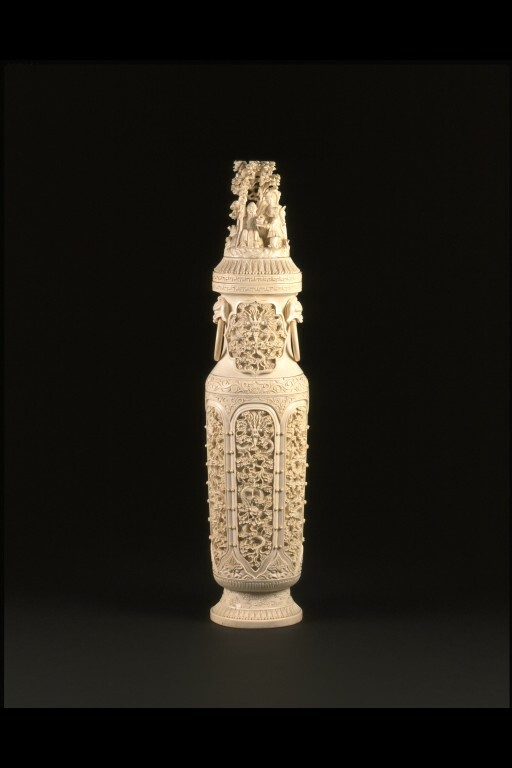 An ivory vase and lid of similar shape, but larger and with different decoration, illustrated in Cox, Warren E. Chinese Ivory Sculpture (New York, 1946). Plate 19, author dates to Daoguang Period. The dragon carving can be compared to that on the fake imperial seals, illustrated and discussed as No. 234 in British Museum for the Oriental Ceramic Society. 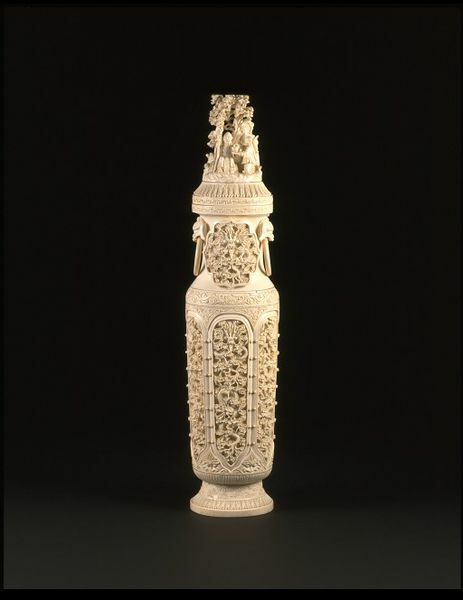 Chinese Ivories from the Shang to the Qing (London, 1984). Clunas, Craig. Chinese Carving. London: Sun Tree Publishing Ltd in association with the Victoria & Albert Museum, 1996. p. 29, fig. 22.